When approaching the writing of Jolley’s biography, it was with some skepticism that the author regarded the many claims regarding the extent of his fielding failures. The record seems clear, though: Anecdotes aplenty there may be, but his reputation was well-earned. SABR’s Terry Turner has rightfully suggested that had Jolley had the benefit of playing as a designated hitter in today’s American League, he may well have been one of the true standouts of the game. His 1928 season, Turner notes, was one of the greatest in minor-league history – winning the Triple Crown and seeing the San Francisco Seals to the Pacific Coast League title while averaging over .400 in back-to-back ’27 and ’28 seasons, this in a league agreed by all to be just a notch below the major leagues. Some time after graduating from high school, Jolley broke into the minor leagues as a pitcher, signing with Shreveport. He said he’d put some things in a satchel in 1922 and made his own way there, to try out. He was signed and immediately farmed out to the Greenville (Mississippi) Bucks. Manager Buck Stapleton of the Class D Cotton States League team saw Jolley put up a 12-7 record, and get a taste of A ball at the end of the season with the Shreveport Gassers (Texas League), where he was 1-1, but with whom he sank to 2-8 in 1923. Smead Powell Jolley’s unusual first name appears to have been bestowed upon him by parents honoring a prominent lawyer and friend of the family in his hometown of Wesson, Arkansas, about 10 miles from the northern border of Louisiana. He was born nearby at Three Creeks, Arkansas, near El Dorado, on January 14, 1902, according to the family Bible as reported to the National Baseball Hall of Fame by the office of the mayor in El Dorado. According to John J. Ward, writing in the February 1931 issue of Baseball Magazine, Smead’s father owned a 640-acre farm and raised a big family, too – with nine children, six boys and three girls. Apparently his father played baseball, or at least had a team, wrote Atlanta sportswriter Furman Bisher. [Sky, April 1989] Smead’s father was kept busy farming cotton and never saw his son play in the major leagues, but Schoolboy Rowe, the major-league pitcher, said that old man Jolley was a “baseball nut” and could rattle off every base hit his son ever made. In 1924, still under contract to Shreveport, Jolley pitched for the Texarkana Twins (D ball, East Texas League). He was 9-9 in 21 games as a pitcher, and led his team in hitting with a .371 average, mostly while playing outfield in another 91 games. During the year, he also appeared in six games for Shreveport itself and 11 in Oklahoma for the Western Association’s Class C Bartlesville/Ardmore Bearcats, but never on the mound. His hitting had come to the fore, and in 45 at-bats for Bartlesville, he hit .511 with four homers. Come 1925, he spent most of the year in D ball again, this time with the Corsicana Oilers of the Texas Association, hitting .362 in 127 games. Corsicana had reportedly purchased his contract from Shreveport, and it was then that he first became a full-time outfielder. The team won the Texas Association pennant and Jolley’s 180 hits tied him for the league lead. Sold on to San Francisco, Jolley played with the Seals at the very end of the year; he got in another 132 at-bats with the Seals over 34 games at the end of the longer PCL season and hit at a .447 pace. The Seals played in the Pacific Coast League, Double A baseball – the highest minor-league level of the day. Paul Waner’s .401 batting average led the league, and helped the Seals hold first place. Jolley didn’t have enough at-bats to qualify. Jolley found a home with the Seals and played there for the next four seasons, 1926-1929, as well as finding a marriage partner in Elizabeth (Betty) Van Pelt while on a blind date. [Bisher, Sky, p. 106. He was reportedly almost late to his wedding when his car ran out of gas. See The Sporting News, January 25, 1964] On the diamond, Jolley put up batting averages of .346, .397, .404, and .387 with 138 homers in the four years. Smead pitched seven innings in 1925 and eight in 1926, with a 1-0 record each year, but his forte was clearly as a hitter. His .397 led the league in hitting in 1927, and his 163 RBIs led the PCL as well. Teammate Lefty O’Doul was league MVP, and San Francisco had quite an outfield with Earl Averill joining Jolley and O’Doul. In 1928, Jolley led in almost every offensive category, winning the Triple Crown (.404, 45 homers, and 188 RBIs, though it’s worth noting with regard to the homers and RBIs that the Seals played 191 games that season.) In 1929, it was Ike Boone who tore up the league on offense, but Jolley’s .387 with 35 homers was nothing to sneeze at. He collected 314 hits, his second straight season over 300. He also averaged over 30 assists in his four full seasons with the Seals, but his fielding showed signs of being subpar as well, with 55 errors in the same period. Several of the assists came from charging balls in Recreation Park’s small right field and firing to get the runner before he could reach first base. The September 23, 1929, Sporting News said that scouts had passed Jolley up because of his fielding. (Cardinals coach Johnny Riddle once said he fielded “like a kid chasing soap bubbles.”) [The phrase was used by John McDonald in a January 25, 1964, Sporting News look back at Jolley’s career. The November 14, 1929, Sporting News had him on the front page, dubbed the “Arkansas Assassin” with a comparison to Babe Ruth, in that both began as pitchers and both were left-handed hitters with power. Jolley committed his third error in a May 8 game against the Red Sox at Fenway Park, and it was a costly one. Though he had tripled in the top of the fourth inning, he was left stranded. In the bottom of the fourth of a still-scoreless game, the Red Sox singled twice. With two outs, Tom Oliver singled to Jolley in right field. Smead charged the ball, hoping to grab it and fire home to prevent Hal Rhyne from scoring. He completely missed the ball, overrunning it, and by the time he retrieved it, two runs were home and Oliver was on third. The Red Sox won the game, 3-1. When managers later fretted that Jolley sometimes cost them more runs than he drove in, this game stands as the first such instance in the big leagues. The problem with the story is that a perusal of box scores on Retrosheet during his entire major-league career shows no game in which Jolley was ever charged with two errors in the same game, He did commit 44 errors in 418 games, and had a career major-league fielding percentage of .944. His minor-league fielding percentage was nearly the same, .954. Jolley’s fielding wasn’t uniformly bad, and on June 10, 1930, it saved a game. Not only had he singled and homered, but he threw out what could have been the potential winning run for Philadelphia in the top of the 10th, cutting down a runner at home plate – and then did it again in the 11th, on a great running catch and a rifle shot to the plate. The White Sox won it, 7-6, in the bottom of the 11th. He wasn’t fast on the bases, and pitcher Ted Lyons often came in to run for him if it was late in the game and Jolley reached base. He stole five bases in his four major-league years. In his first season with Chicago, 1930, Jolley appeared in all but two games, drove in 114 runs, and batted .313. “I feel that I’ve been in a slump all year,” he told John J. Ward of Baseball magazine. “When I was a cleanup hitter with the San Francisco Seals, my normal gait was .380 or better…The pitchers in this circuit are not so much better than they are on the Coast, but there are more of them. If you drive one from the box, another just as good will take his place. So you are called upon to oppose a type of pitching that is pretty constant and good all the time.” [Baseball, February 1931] Had he swung something lighter than the 40-ounce bat Ward said he used, he also may have gotten around quicker on the ball. Jolley’s first year was his best year. Come 1931, he was saddled with injuries and maladies – despite coming to spring training in far better shape than in 1930 – got into only 54 games and had only 110 at-bats, as 31 of his appearances came as a pinch-hitter. He hit well, though, an even .300. The first setback came in early April, when Jolley had to go to Chicago to have boils surgically removed from the base of his spine. He lost a full month, and even when he came back was hampered. On May 21st he broke a bone in his ankle while being erased trying to score a key run at home plate. He lost more than two months this time, and lost a bit thereafter in the baserunning department. On July 16, he came back and hit a pinch-hit homer off Firpo Marberry of the Senators. From July 28 through August 8, he stroked five consecutive pinch hits. His record as a pinch-hitter in 1931 was .448, including one home run and six doubles. The White Sox finished in last place, and Donie Bush was replaced by Lew Fonseca. 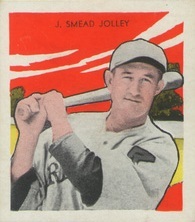 Jolley appeared in 12 games with the White Sox that April, hitting .357 and driving in seven runs, but Fonseca swapped him (plus Johnny Watwood, Bennie Tate, and $7500) to the Boston Red Sox in order to acquireJack Rothcock and catcher Charlie Berry. The White Sox manager acknowledged that it was a mixed bag: “I really hated to let the big ape go. With that bat and rifle arm, I know there’ll be days when this deal will haunt me. But what could I do? Every time a ball went to him in the garden I shuddered. I tried to make a catcher out of him. But a fly ball is still a fly ball in the outfield, or behind the plate, and Smead was allergic to ’em. … He’s a swell guy to have around but I just can’t afford to give away all those runs.” [HOF file p. 19] For at least 25 years afterward, a loyal group of White Sox bleacherites – many of whom grew up to become doctors and lawyers – convened the Smead Jolley Boosters, a fan club in his honor. Their 1959 dinner attracted some 800 attendees. It wasn’t as though Jolley had been traded to a contender. The 1932 White Sox were the very worst team in the history of the franchise, losing 102 games for a winning percentage of .325. They were, however, a notch above the 1932 Red Sox – who also fielded the worst team in their history (43-111, a .279 winning percentage). This was the year when Dale Alexander came over from the Tigers and won the American League batting crown with his .372 average. Jolley was second on the Red Sox with a .309 mark. He got in a full year, playing in 137 games, banged out 18 homers and drove in 99 runs. His May 5 homer was said to be close to 500 feet, deep into the center-field bleachers. The Boston Globe wrote, “When Jolley goes to bat, all the outfielders back up against the fences,” but five days later Globe columnist Dave Egan declared, “He’s giving away more runs than he knocks in with his bat.” Clumsy baserunning knocked down Mel Harder fielding a roller he hit, and Jolley was called out for interference, leaving the Red Sox one run short of catching the Indians in a 5-4 game. Jolley began the season playing left field for the Red Sox, wearing No. 9. There were more gaffes in the field. Jolley took apparent umbrage at taking guff over a ball that had struck him on the head instead of nestling in his glove. “It did not hit me on the head,” he groused. “It hit me on the shoulders.” [Turner presentation to SABR] If he made a good play, like the over-the-shoulder running catch on May 15, it became news: He’d make the headlines. He hit two homers on May 16, and was robbed of a third one, but – as happened so often that year – the Red Sox still bowed in defeat. May 23 may have illustrated the frustration that manager Shano Collins had – Jolley hit a long home run in the early part of the game, then staggered under a high fly ball that landed behind him while Heinie Manush scrambled around the bases for an inside-the-park Griffith Stadium home run. On June 4, Jolley took a header on Duffy’s Cliff, then caught Ossie Bluege’s high fly ball while in a seated position. On June 9, though, Smead's error cost the Red Sox a game. On September 19, Jolley caught his first major-league game. It was in Detroit, and he fielded well as well as winning the game with a three-run homer. He never committed an error in the five games behind the plate, but there were the four Senators stolen bases against him and Ivy Andrews on the 20th. Ossie Bluege stole bases three days in a row against him, remembering later, “He could never fathom those shinguards. Invariably while chasing foul balls, he’d get himself tangled up in them, and the ball would drop safely. Smead was only around four years, but during that time he furnished many a laugh. … The fellow was a great hitter, but once he left that batter’s box, he just didn’t know his way around.” [HOF file, pp. 26, 27] Jolley was apparently decent at handling pitchers, though, since the Red Sox penciled him in as catcher on their 1933 roster. Spring of 1933 started with a dislocated finger on March 15 while catching, knocking Jolley out of action for two weeks. It was the last time McManus asked him to catch. He played on Opening Day, but was 0-for-4 as Yankee Stadium and the rest of the nation enjoyed legal beer for the first time since Prohibition. It appeared to be a somewhat less adventurous year in the field, though he played fewer games (118) and committed only nine miscues. Percentagewise, though, that was a decline, and his batting average fell to .282 with 65 RBIs. It was the only time in Jolley’s 20 seasons of professional baseball that he hit below .300. During the winter meetings, Jolley found himself shipped hither and yon all in one day, December 14. The Red Sox traded for Carl Reynolds, sending the St. Louis Browns both Jolley and Ivy Andrews and some cash as well. Then the Browns traded Jolley back to the Pacific Coast League, to Ossie Vitt’s Hollywood Stars, along with Wally Hebert and Jim Levey for a phenom who wasn’t: AlanStrange. Jolley was 3-for-6 his first day back in the PCL. His .360 led Hollywood (and was third in the league), and his 23 homers were just one short of tops on the team. In 1935, Jolley again was third in the league with his .372 average. Joe DiMaggio of the San Francisco Seals was second. There were further adventures in the field, like the day one of the Seals hit a towering fly ball. Joe Becker of the Seals said, “Poor Smead lost it, that is, if he ever had it in the first place, and looked up into those clouds despairingly. Suddenly it came down, and conked him right on the skull. The batter got to third, and if he hadn’t almost wet his pants laughing, he could have crawled home.” Smead’s remark when he returned to the Stars’ dugout: “I don’t get paid for fielding. I get paid to hit.” But he had a sense of humor about it. Backer recalls him saying, “If I ever wanted to go on a reducing diet, I’d just change my contract so I got paid for my fielding instead of my hitting. That way I wouldn’t make enough to buy groceries, and pretty soon I’d be down to 180 pounds.” [HOF file, p. 31] Smead got into a movie in 1935, playing an uncredited role in the baseball comedy Alibi Ike. In 1936, Smead came back east, playing in the International League for the Albany Senators. Like the Stars in 1935, they finished in last place, but Smead led the league in batting (.373) and hits (221, with 52 doubles also leading the league). His .951 fielding percentage also led the league, as the worst regular outfielder. Nonetheless, after 1936, he’d become well enough known as a slugger that the New York World-Telegram dubbed him the Babe Ruth of the Minors. [New York World-Telegram, April 28, 1937] It was a disappointing season in 1937, with Jolley getting into only 65 games. The International League’s Jersey City Giants signed him, but after only 12 games released him to the Southern Association’s Nashville Volunteers in May. He was hitting .333 at the time, but was said to be “a detriment in the field and on the basepaths.” [New York World Telegram, May 12, 1937] He averaged .304 for the season, shortened when he was suspended on July 14. He’d been sold by Nashville after 53 games there but refused to report back to Albany, now an A-level ballclub in the New York-Penn League. He hoped to catch on with the Portland Beavers for 1938, but wound up with the Oakland Oaks. After baseball, Jolley worked for many years as a house painter for the Alameda (California) Housing Authority. Turner adds that Jolley “got one final big hit when oil was discovered on his Arkansas property in the mid-1970s.” [Turner presentation to SABR] He lived in Alameda with his wife, Betty, to whom he was married more than 60 years. He took in the occasional Oakland A’s game, and went to a few sports dinners in the Bay Area, but largely spent time by himself. Betty preceded him in death, passing on in 1988, and Smead moved into an Alameda rest home. The sources used in preparing this biography are cited within the text above. As always, Retrosheet, the SABR online encyclopedia, and baseball-reference.com provided a great deal of information. Thanks to Terry Turner, who shared his notes for “Smead Jolley: Arkansas’s Hit and Miss Man,” which he presented before the Robinson-Kell (Little Rock) chapter of SABR in 2009, and to Tim Wiles for his assistance in getting me the Hall of Fame’s file on Jolley. An anonymous researcher at the Hall was apparently taken by Jolley and wrote an extensive 33-page summary of Jolley’s career, complete with a number of quotations from Jolley’s contemporaries, many of which have been used in this profile. Thanks as well to Stephen Boren and Stephen Milman.